The easiest way to remove rocks from a garden is with a cultivator or tiller and a garden rake. It will require a little work, but it is a simple process if you have the right tools. Rototiller or cultivator: These motorized machines feature two sets of rotating tines that dig up the soil. The cultivator is a smaller version of a tiller and ideal for working small gardens. 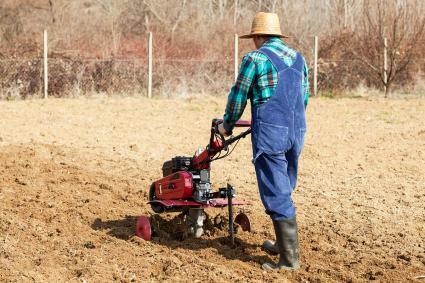 If you don't have a cultivator or tiller, you may need to rent or borrow one. Scoop shovel: Choose a long-handled or short-handled scoop shovel according to personal preference. Garden rake: Select a quality garden rake with steel tines, not to be confused with a leaf rake. A garden rake has very sturdy tines that are ideal for raking up rocks. The typical head width is 13.5". Pick: You may need a pick if you run into any large rocks that need to be removed. Wheel barrow or bucket: You will want something to transport the rocks from your garden. A wheel barrow or bucket can be used to carry a load of rocks to a designated area. Work gloves: You'll also need a good pair of gardening gloves since raking can cause blisters very quickly. Once you have assembled the appropriate tools, follow these steps to take rocks out of your garden. You'll want to break up the soil in your garden. The easiest way to do this is with either a cultivator or rototiller, which will be much less taxing than trying to double dig a garden space. Use the machine to dig at least six to eight inches deep. This will loosen the soil, and any small rocks within the soil will be tilled to the surface or at least within easy access. 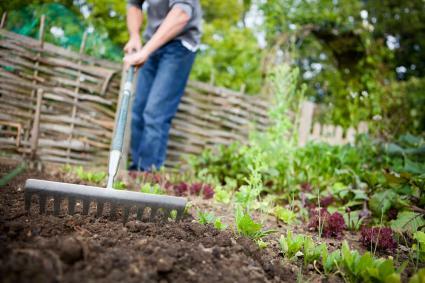 Once the soil is broken up, you can use the garden rake to smooth out the planting surface. It's during this process that you'll begin to find rocks. The width of a garden rake paired with the amount of space between its tines makes extracting rocks from your garden easy. 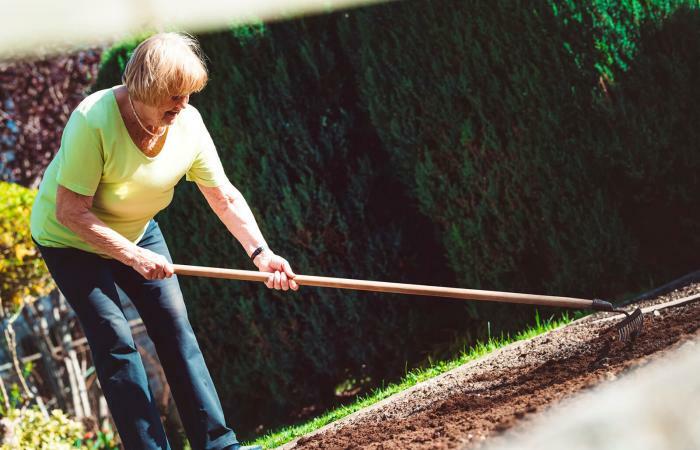 Raking is far less stressful on your back than bending over and trying to pick up individual rocks. The rake's width means you can move a large amount of rocks in very little time. 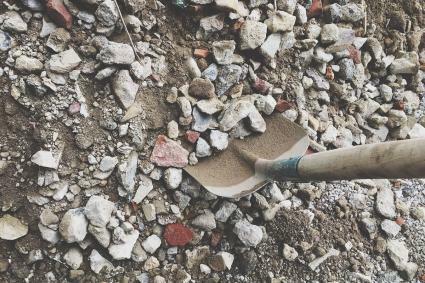 The easiest way to remove rocks from a field garden is to rake them into a pile and then use a scoop shovel to dump into a bucket or wheel barrow. 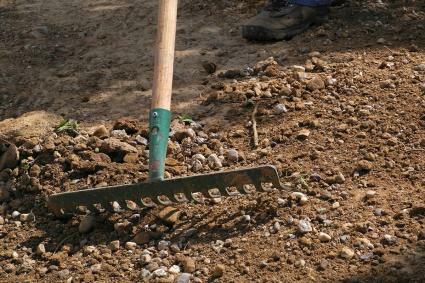 If you need to remove rocks from a garden bed, you can rake the rocks to the edge of the bed. Scoop the rocks into the cradle of the garden rake and lift from the bed, then deposit in the designated area. Smaller rocks often escape between the tines. You can still use the rake to capture them. Turn the rake upside down so the tines are pointed skyward. Drag the flat side against the ground and either drag or push the rocks out of the planting area. You can always scoop up the rocks once cleared of the garden area. 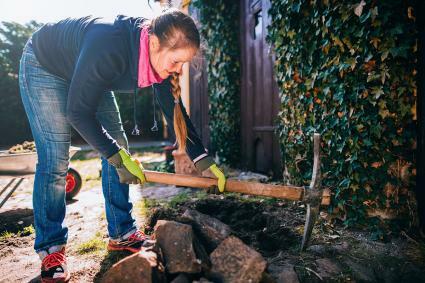 If you happen upon a large rock that is practically buried in your garden, you can remove it fairly easily. Dig all around the rock to loosen the soil with a shovel. Try this first before turning to a pick. Using the shovel is far easier and places less stress on your back and arms. Once the soil is loosened, try to slip the shovel underneath the rock. You may need to dig deeper around the rock by using a pick to loosen it. Depending on the size of the rock, you may be able to use the shovel to pry it free. 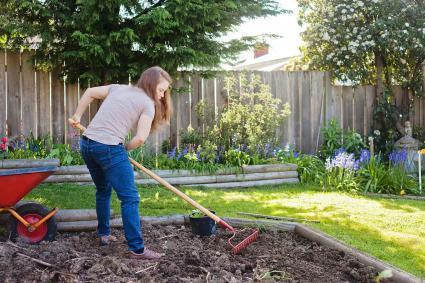 Use the rake to move soil into the hole and level it with the rest of the garden. It's easy to remove rocks from a garden, depending on their sizes and if they're buried very deeply. Follow these steps and you'll be able to take care of this important gardening task. Average size rocks can easily be raked out of the growing space to clear the way for plants.